When pain and injury become associated with our activities, often the causes are related to the way we use ourselves. Sometimes people refer to "posture" problems as the culprit, but its more than posture. It is the dynamic interaction between mind and body over time. Most of my students find that their lessons lead to tangible improvements with pain issues, sometimes quickly, sometimes over a period of time. I also pay attention to how students experience pain. A person who is moving in a more aware, fluid manner may not be as preoccupied with pain. 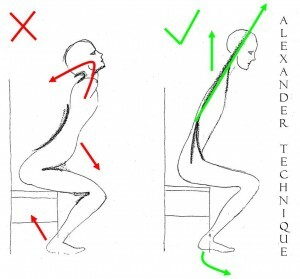 One of the purposes of Alexander Technique is to increase our ability to adapt. Even if there is unavoidable discomfort, the quality of life can still be vastly improved. It is often not necessary to be in pain, so get help! The Alexander Technique is a resource that is available to you now. It does not contradict or replace medical intervention or therapies and I often remind students to get medical care when needed. However, medicine does not address the question of how we are using ourselves, how our habitual tensions might be causing undo pressure on our bodies and the associated injury and pain. In the cases of accidental injury or chronic medical conditions, the Alexander Technique teaches you how to take care of yourself to as not to do more damage, adding insult to injury. Although students progress differently according to their individual conditions and goals, I find that they always experience an overall improved quality of life in terms of reduced discomfort and more positive outlook.